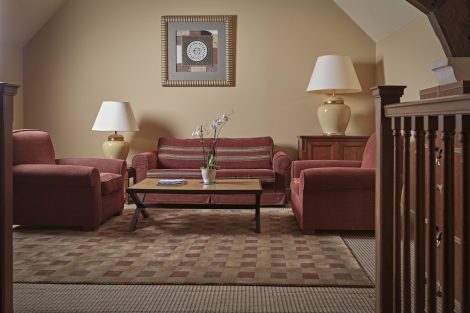 For the perfect Cotswolds luxury hotel stay, the Deluxe Suite is beautifully appointed. With a private entrance from the main courtyard, it feels like stepping into your very own Cotswold country house retreat. Arranged over two levels the Deluxe Suite offers two luxurious bathrooms and a mezzanine gallery with second sitting area. Indulgent touches are waiting in your suite for you. Homemade biscuits & elderflower cordial, still and sparkling mineral water, Whatley Manor chocolate bar, coffee and tea making facilities. Both bathrooms have heated floors and offer Molton Brown amenities. The Deluxe Suite benefits from efficient WiFi and our chrome cast TV’s allow you to stream directly from your own devices. This spacious suite is perfect for two but has the additional benefit of being able to accommodate additional beds for family use.